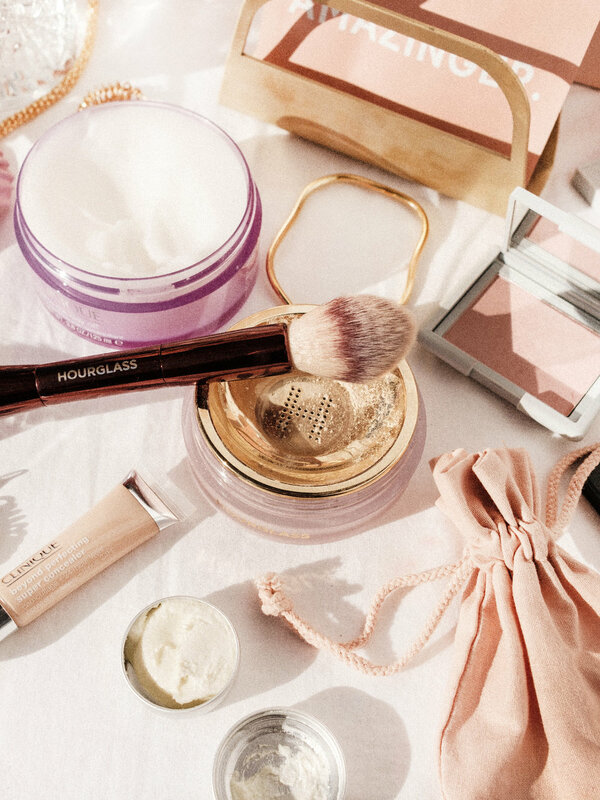 I am back to gather my beauty favourites from the last month or so and let you know what is standing out amongst the chaotic collection of products on my vanity. Highlights definitely for the month start with one of my new favourites, Clinique's Take The Day Off Cleansing Balm. Whenever Clinique comes up, this is always a crowd favourite but for some reason I only tried it for the first time in the last month. If you want a cleanser that takes all your make-up off without any troubles or stripping your skin - this is one you might enjoy. Especially in winter I think this will be a keeper because it is super gentle on dry skin. Honourable mentions also need to go to the Go-To Skin Transformazing Sheet Masks - These are great for a quick hit of hydration and lots of serum in the packet to use on your décolletage and neck which is a bonus. Also for dry hands in the winter I have been loving the Lush Cosmetics Cuticle Butter! In order of application let's start with the Clinique Beyond Perfecting Concealer, it is high coverage but doesn't feel heavy. I don't like a concealer to be too matte as I use a luminous foundation so this has the perfect balance between luminous but not slippery or greasy looking. It claims to wear well for 24 hours but to be honest, I am not one to wear makeup for that long to try it out. For the next product I have to disclaim that I have only been using this the last 3 days but I already am so damn obsessed. I know I have said this thousands of times but I don't like my base to look matte. But my problem always was that I wanted to still set my skin in place. If you have the same problem I would suggest giving the new Hourglass Veil Translucent Setting Powder a go. It sets your base in place without leaving a white cast, or drying out the skin. The matching brush is beautiful and soft but not necessary unless you're wanting to treat yo' self. If you saw my stories around a month ago trying the Mecca Max Banana Bake Skin Powder you know this product is basically magic for under eye bags. It pretty much eliminates any shadow or darkness under the eye and completely brightens the area. Use lightly to avoid any heaviness under the eye though. Now I can't talk about the last month of makeup without discussing the NARS x ERDEM collection. 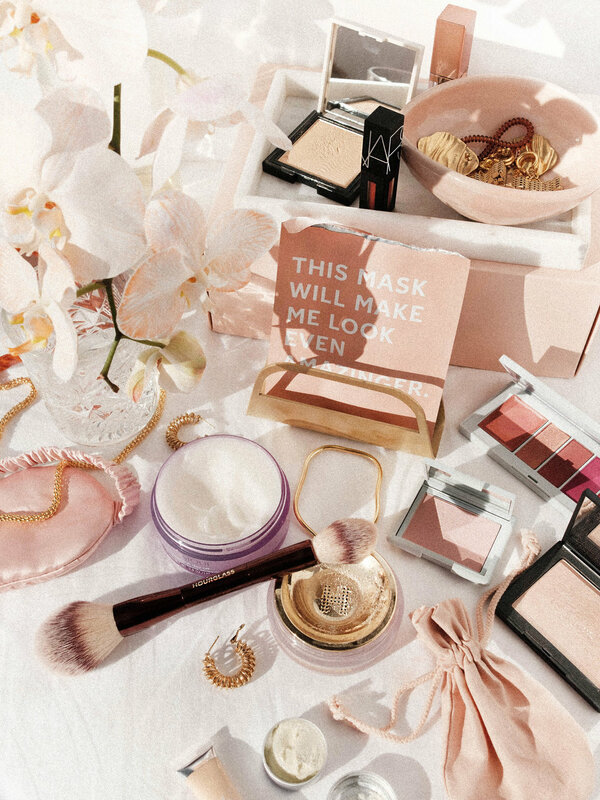 No doubt, the packaging is the star of the show but there are also a few gems that will be making an impression on my makeup vanity. The blush in Loves Me Not is so beautiful on fair skin because it isn't too vibrant but also because it carries a slight luminosity to it. The shade Loves Me if you have a tan or deep skin tone though. Then there is the Lip Shadow Palette... Is it the quickest, easiest thing to apply? no but the colours and effect it creates makes it worth it. You can not only mix to create your desired shade but it leaves a soft, matte finish on the lips. If you're not into a matte lip or are time poor when it comes to doing your make up though this may not be the product for you. If you are someone who loves a matte lip but needs something quick and easy to apply I would suggest trying out the Powermatte Lip Pigments by NARS. They are super comfortable and opaque on the first swipe. I personally am loving the shade Hot Blooded for a terracotta red lip. This blog post was not sponsored and all opinions (as always) are my own.